Radio Ranch is a dude ranch resort owned by Tom Baxter and popular radio entertainer Gene Autry. Twenty thousand feet beneath the Ranch lies the super-scientific, highly-advanced kingdom of Murania which is rich in radium deposits and ruled by the beautiful Queen Tika. Gene's radio contract is such that he must broadcast daily from the ranch or he will lose it. 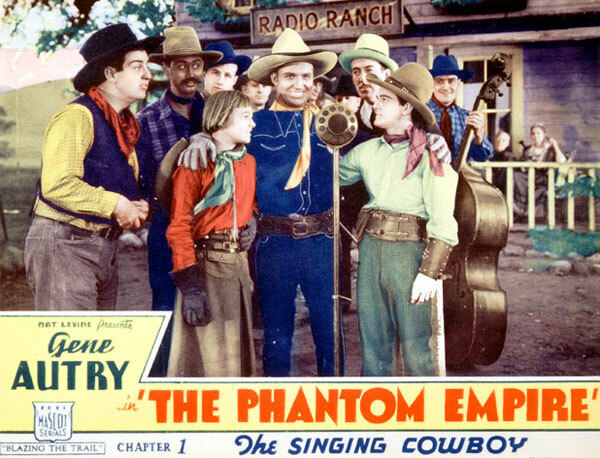 Complications arise when a discredited scientist tries to steal the ranch from Gene for its radium and the Queen tries to protect her kingdom from the outside world by getting rid of Gene Autry and the Junior Thunder Riders. The Phantom Empire is also known in edited form as Men With Steel Faces, Radio Ranch, and in the United Kingdom as Couldn't Possibly Happen. 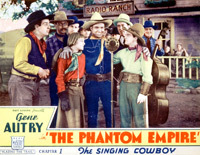 Introduces the story and all of the major characters, including Gene Autry, Frankie and Betsy Baxter, Professor Beetson, and Queen Tika. It offers a glimpse of the Muranian world where Queen Tika watches the action above the ground from her special viewing room. It ends with Gene and the kids falling from a cliff after being chased by Argo, a Muranian. Gene sings Uncle Noah's Ark and That Silver-Haired Daddy of Mine. Gene, Frankie, and Betsy are saved from certain death by the Junior Thunder Riders. During an exciting, staged stagecoach chase at the ranch, Tom Baxter is killed. Gene is arrested, escapes, but falls off his horse as Murania's Royal Guard closes in. Frankie and Betsy stowed away on an airplane in pursuit of Gene, but the airplane explodes when a Muranian torpedo hits it. Gene sings I'm Oscar, I'm Pete. The Baxter kids escape from the plane by putting on parachutes, while Gene has managed to join the mysterious Thunder Riders. Queen Tika is angry that Gene has not been captured, so she condemns the Captain of the Guard to death in the "Lightning Chamber." Gene switches clothes with the unconscious pilot of the plane and hides, overhearing a conversation where Beetson confesses to Baxter's murder. Beetson finds out and chases after Gene, whose car plunges over the side of cliff, crashing below. Gene is saved when he transfers to the rear of Frankie's horse a split second before his car crashes. Queen Tika searches for Argo, who is secretly powering an aerial torpedo to destroy Radio Ranch. She stops him, telling him that she alone will determine when the destruction takes place. Meanwhile, Gene makes his radio broadcast from Frankie's laboratory, and is trailed by Beetson. He and the kids try to escape the lab, but are caught in a terrific explosion. Gene sings Uncle Henry's Vacation. Gene and the kids are able to exit the lab just in time due to the Junior Thunder Riders. Concerned about the next day's broadcast, Gene decides to use the Riders' clubhouse in Thunder Canyon. Oscar disguises himself as a woman to move the equipment. The Thunder Riders close in the clubhouse and the Lieutenant is knocked unconscious. Gene switches clothes with him and is picked up by the other Riders and taken back to Murania. He is unmasked and ordered to the "Death Chamber" by Queen Tika. Argo saves Gene by opening a trapdoor at the bottom of the chamber before he throws the switch to execute. Gene lands in a room where he overhears Muranian rebels lusting for action. They capture him, but Gene breaks free. He makes contact with Frankie and Betsy who decide to ride to the rescue with the other Junior Riders. Two of the Queen's guards activate two deadly robots to find Gene. The aerial torpedo is unleashed, but Gene is able to enter the control room and send it back towards Murania, where it explodes. The torpedo explodes just outside the control room, and Gene's unconscious body is pulled from the wreckage. Queen Tika realizes she has a traitor in the midst, and orders Gene to be brought "back from the dead" so that she may learn who it is. The power goes off right after, due to Argo and the rebels, and Gene breaks free once again. Frankie and Betsy climb down to an old mine entrance they believe is the way to Murania, but are trapped by Beetson. Gene is involved in a swordfight with guards and is forced over the side of a metal walkway. Gene grabs the underside of the walkway and swings to safety. After battling guards, he makes it back to the surface. The Baxter kids start a fire to get help, which Gene sees. He helps them, but not before Beetson arrives with his plane. To make his broadcast, Gene forces Beetson's pilot to fly him to the ranch. Frankie rigs up a transmitter in the plane and Gene performs. The pilot escapes and the plane crashes onto the top of a cliff. Gene sings I'm Getting a Moon's Eye View of the World. Frankie and Betsy leap to safety, but Gene goes down with the plane. The Royal Guards then capture them, and they are brought to Murania. Gene, who is alive, goes to rescue the kids, joined by Oscar, Pete, and the Junior Thunder Riders. They are unable to enter Murania as Argo has disabled the electric eye that controls the door. Frankie and Betsy enter the control room and race to the door control, but when they throw the switch they are bombarded by deadly radium rays. Frankie and Betsy are killed by the ray, but not before Frankie pulls the switch to open the door. Queen Tika orders the kids to be brought to the "Radium Reviving Room." Oscar and Pete put on robot disguises. The Queen orders Gene to tell her who saved his life, but he refuses unless Frankie and Betsy are saved. Gene sees the kids and tells the Queen that it was Argo. She is shocked, but forms an alliance with Gene, promising his, Frankie's, and Betsy's safety. She orders death to Argo, who begins the rebellion. A battle ensues and Gene falls on a conveyor belt that moves him towards a flaming torch. Frankie and Betsy find Gene just in time to save his life. Argo informs the men that the Queen is now "in chains" and orders the destruction of all surface people. The Queen is forced to watch executions of her trusted friends, while Gene battles his way towards her. He arrives at the room where the Queen is about to be executed, but is knocked into the path of death-dealing rays. Oscar and Pete arrive in time to pull Gene from the path of the ray. They also rescue Queen Tika. They rush to regain the control room while Argo is temporarily trapped. The ray is turned up, goes wild, and starts to destroy Murania. Argo and his men are killed. The Queen orders Gene and everyone up to the surface, refusing to go herself because it would be "living death." She dies in the destruction, while Gene and friends make it to the surface. Gene returns to the ranch and is able to get Beetson to confess to Baxter's murder. The ranch is safe as Gene sings his last song, Uncle Noah's Ark, for the final broadcast of the season. Dr. Cooper Edward Piel, Sr.